The Friday Organ recital series at Emmanuel was started by Andrew Fletcher in October 2009. They are given on the first Friday of each month at 1pm, from October through June. Entry is free with a retiring collection, and refreshments are available afterwards in the Church Hall. 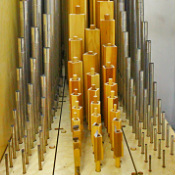 You can also find details of all the recitals at Emmanuel at www.organrecitals.com, along with other concerts given by the guest recitalists in our series. Our recitalists perform on our mobile console, with seating arranged in the round to provide our audience with a full view of the action! You can view this seasons recitals and download our leaflet below. Our own Organist, Josh Roebuck, opens the new season. Rebecca visits us all the way from Germany to perform works by Bach, Widor, and Franck. Sam, Birmingham Cathedrals organ scholar, joins us for the first time to close the year with an exciting and varied programme. Peter opens the new year with music from France and Germany. We are pleased to welcome Peter back here- a well know musician in the Midlands. Nicholas is the Organist of St Georges, Hanover Square. He joins us this month with a most interesting and eclectic programme. Ashley, soon to take up the post of Assistant Director of Music at Birmingham Cathedral, welcomes spring triumphantly with Wagner along with a richly varied selection of pieces from Baroque Germany to modern England. Richard returns to Emmanuel to give us the wonderful opportunity to hear two masterpieces in their entirety. This month we welcome back Anthony, Organist of St Chads Shrewsbury and Emmanuel Choirs first Organist. Paul returns to us again to close the season with a bang in a recital including transcriptions and even some Jazz! 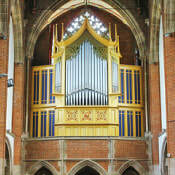 For more information about the Organs at Emmanuel, please click here. ​You can also view a selection of our past recitals here.